I find myself always oven roasting broccoli, which is a fabulous and delicious way to eat it but I often need a diverse array of taste sensations in my life to keep my belly and mind happy. On a mission to transform my broccoli into something new I came across this recipe that I loosely followed. One of my other favorite broccoli recipes is broccoli cheddar soup, oh how I miss it being paleo and all. I'm very excited to get my garden going this year, last Friday I stocked up on my garden supplies. My mother and I went on a mother/daughter date to my local nursery City Farm. This place rocked my socks! They had so many varieties of tomatoes I couldn't even count them all, if you get a chance check it out. This year I got two different types of kale, beets, lettuce, zucchini, swiss chard among other tasty veggies. Today I weeded most of the garden bed and am getting ready to lay down some fresh soil then I will be ready to plant, I love Spring! 1. 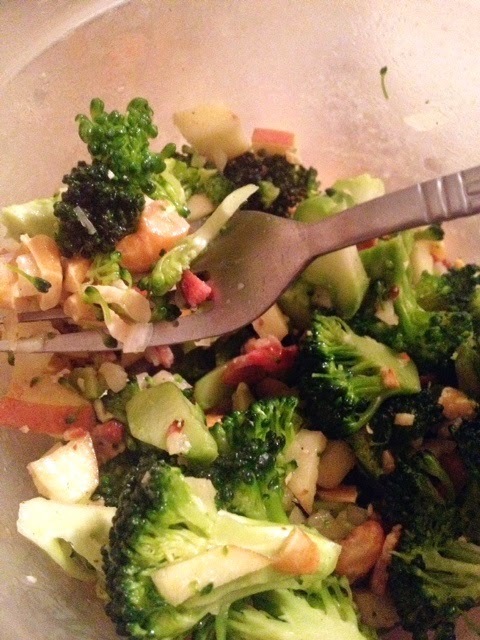 In a large bowl, mix together the broccoli, onion, bacon, apple and cashews. 2. In a separate small bowl, whisk together the apple cider vinegar, olive oil, coconut milk, honey, mustard powder, sea salt and pepper. 3. Pour dressing over mixture and stir well. Refrigerate at least 6-8 hours or overnight. Pull out of the fridge about 10 minutes before serving, to allow dressing to soften (it firms up in the fridge since it’s an olive oil based dressing). I'd love it even more if you had calorie and nutritional information.